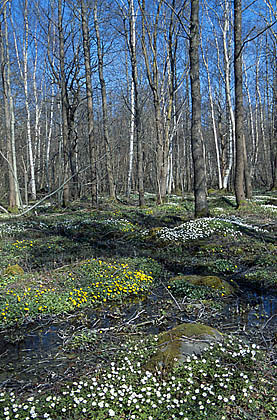 Black alder marsh at Võhma, Saaremaa. The weather in the week was changeable – cool and rainy from time to time, then warm and sunny. On two of the days the average air temperature rose above 10 degrees, maximum air temperature in daytime was 18 – 10 degrees. In the mornings there were often ground frosts. During the week grasslands turned noticeably more green. It was the beginning of leafing. Young leaves opened on berry bushes, the alpine currant hedges were green. Woods had a bright green hue from bird cherries, alpine currants, honeysuckles; the first mouse ear size buds could be seen on some silver birches. Many willows, elms and witch elms were flowering. Maples were about to flower. The catkins of the silver birches had stretched longer but didn’t yet spread any pollen. The many-coloured cones on larch trees that were just beginning to go green were particularly beautiful and eye-catching. Yellow narcissi and forsythia bushes flowered in the gardens, in the woods the blue of hepaticas was replaced by the white and yellow of wood anemones. The development of plants had advanced two to three days before average. Of migrating birds during the week the chiff-chaff, willow warbler, pied flycatcher, cuckoo and barn swallow arrived. In the fields fast soil cultivation and sowing went on. The drying up of soils was uneven and in places the soil remained wet in the lower parts of the fields. Periodically field work was prevented by rain.